Natural sleep comfort for the small ones. To play - rest - sleep, for small, light babies on the floor. Sleep with sufficient padding, so that parents can also lie on it. On the floor or on a mattress cover / slatted frame with close slats. Sleeping like a baby should, stable and breathable. Allrounder with a firm and a soft side, wrapped in wool, carries babies up until their school age. Fine Jersey fitted sheet made of organic cotton, with a solid and warming quality. Babies sleep a lot, so they need a good sleeping place. It should be stable, quiet, safe and natural. 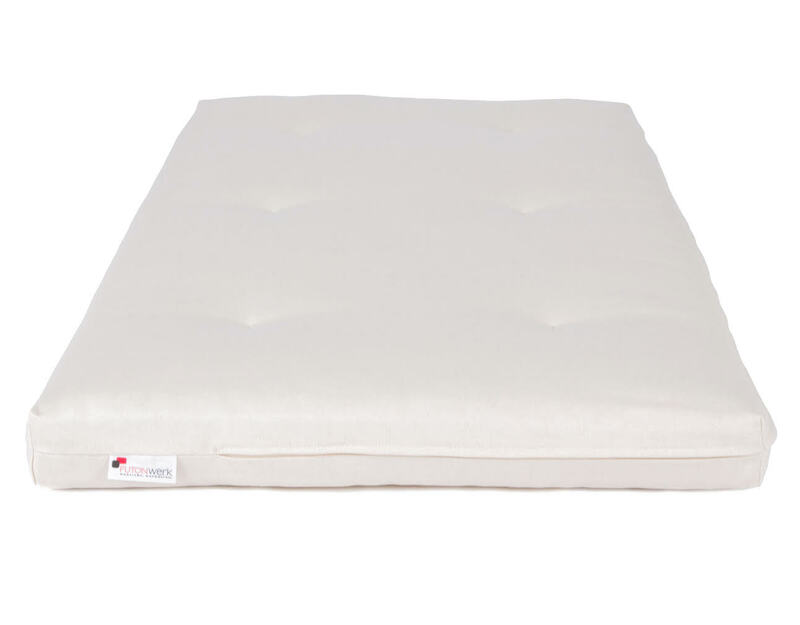 We may not be able to provide peace and safety, but we offer a solid, stabilizing, natural, cooling and heating and cozy sleeping baby futon in different versions for children aged 0-4. Also make sure to have a good slatted frame, which should be rigid, with close slats (>4 cm). If that's not available, put a mattress cover under or stretch a cloth across the slats in order to compensate for the gaps. However, the baby futon is best placed on the floor due to it being evenly stable and preventing babies from being able to fall. Additionally, it's easier for the cuddling or story-reading parent to lie down next to their baby and even fall asleep alongside if the futon has a normal size and is placed on the floor. For all classic baby beds you can find a selection of suitable baby futons in standard sizes 70/140cm or 60/120cm on this page.